Summer has officially hit Los Angeles. This heat totally has the ability to humble me, especially considering I live in an apartment without air-conditioning. Phew! Climbing temperatures mean that popsicles are an absolute must. My favorite thing to do is pick up fruit from the farmer’s market, puree it and pour it in popsicle molds. I consider July to be a fantastic month for strawberries. They’re tart, perfectly sweet and they’re usually cheap, cheap, cheap. Even though strawberries are perfect on their own, there’s something that happens when you puree them. They’re a bit overwhelmingly tart so I added sugar to balance it out. Feel free to substitute honey for sugar or any other sweetener you prefer. I’ve always been a sucker for the combination of strawberries and cream. It truly is one of the great flavor combinations. In a food processor, add the strawberries and pulse until pureed. Add two tablespoons of sugar and pulse once more. Give it a taste and adjust the sugar according to your liking. In a measuring cup, measure out the heavy cream and whisk in the remaining 2 tablespoons of sugar. Option A. 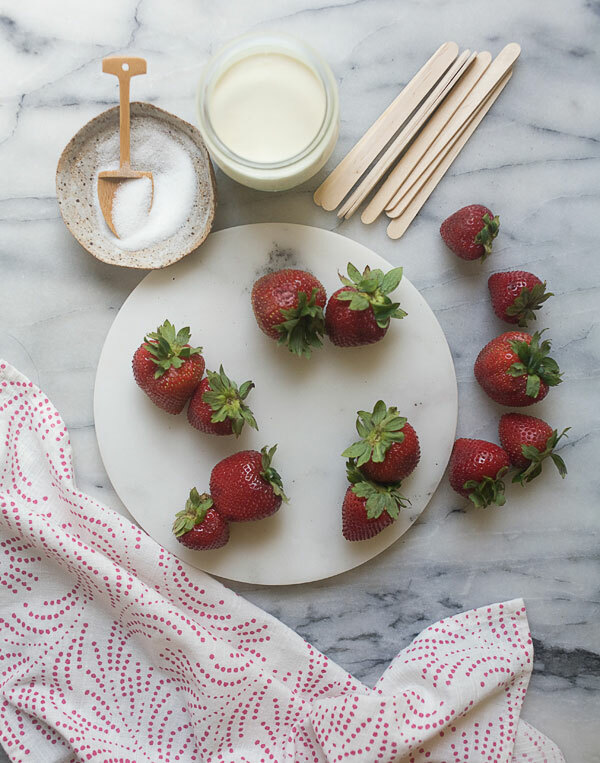 You could mix the heavy cream into the strawberry puree, fill up the molds, add the sticks and freeze overnight. Option B. 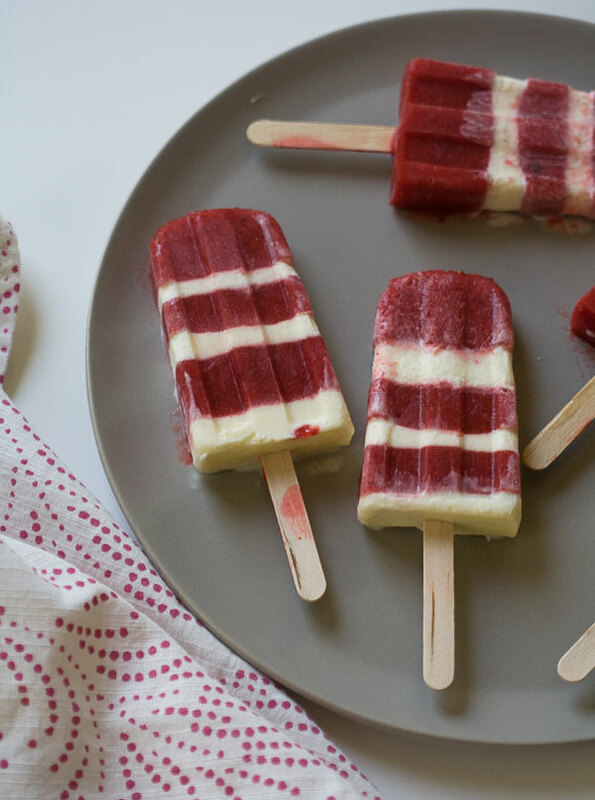 Fill up six popsicles molds about 1/4 of the way and transfer to the freezer for 1 hour. At the 1-hour mark, remove them from the freezer and add about a tablespoon of cream to each mold. Transfer to the freezer for another hour and repeat the process until you've filled up the molds. Option C. You can add the puree to the molds about 3/4 of the way and divide the cream between molds. 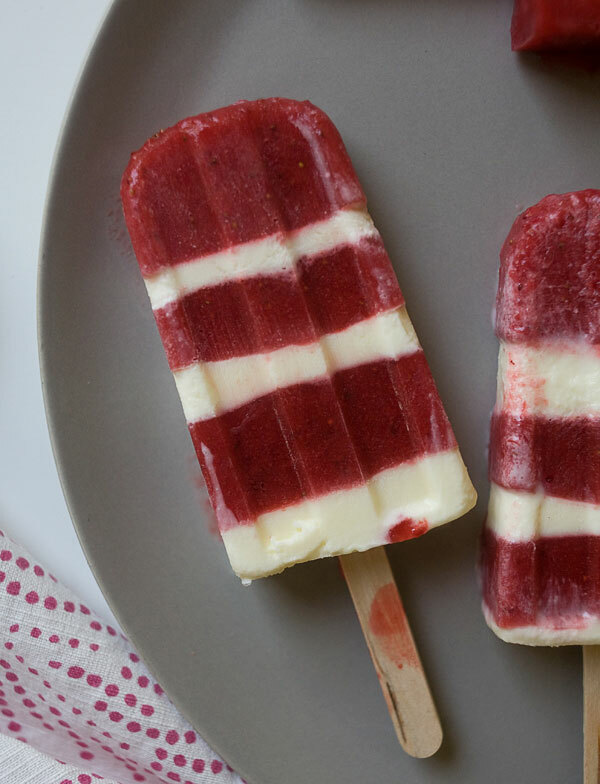 An automatic swirl will happen with the popsicles, resulting in some very attractive pops!